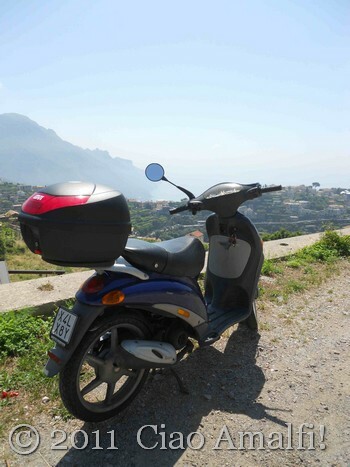 Last week I rode my motorino to Ravello for a haircut at my favorite salon on the Amalfi Coast – Total Hair Design by Gerardo. It was a beautiful morning and instead of heading directly home, I decided to enjoy the sunny weather and ride the scooter all the way around the road that circles through the town of Scala. With a lot of curves and steep roads and hardly no traffic, it’s a great ride. Oh, did I mention the views are outstanding? 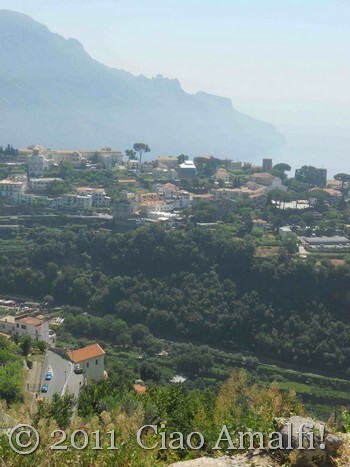 This is the first spot I pulled over, where there is a lovely view across the valley looking over to Ravello. I took the chance to finally take a few photos of the Liberty motorino we bought last month. It’s been so much fun to learn to ride, and I love the freedom of being able to get to market, do shopping and get a haircut without having to plan half a day just to walk there! Even though the scooter is about 10 years old, it’s in pretty good shape and it runs very well. 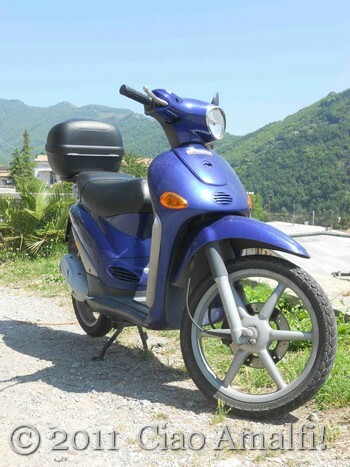 It’s perfect for getting around the Amalfi Coast, without going so crazy for parking! I stopped along the drive to take a few photos. Above you can see the Duomo of Scala and across the valley is Ravello. On a less humid day you can even spot the beach in Maiori from this high in Scala! 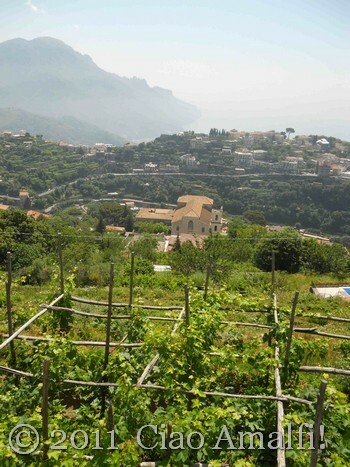 When I stopped again, I could spot the Duomo of Ravello and the town’s main piazza just across the valley (above). Just minutes before I had crossed that piazza on my way to Gerardo’s! Scala has six hamlets spread out across the side of the mountain, and it’s a beautiful and peaceful little town to explore. I love how quiet it is, especially after being in the late morning crowds of visitors in Ravello. 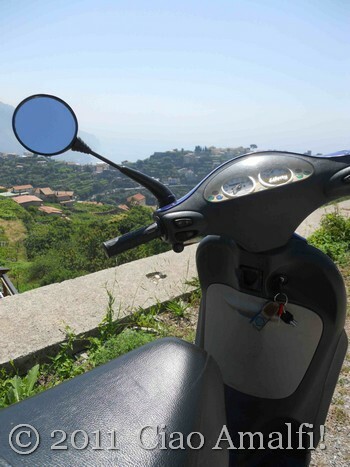 It was a beautiful ride on the scooter, and one I would highly recommend if you rent a scooter while visiting the Amalfi Coast. You didn’t actually think you’d get a picture of the new haircut after it had been smushed under a helmet, did you? Let’s just say it’s really short and makes the “helmet hair” situation a lot less noticeable! 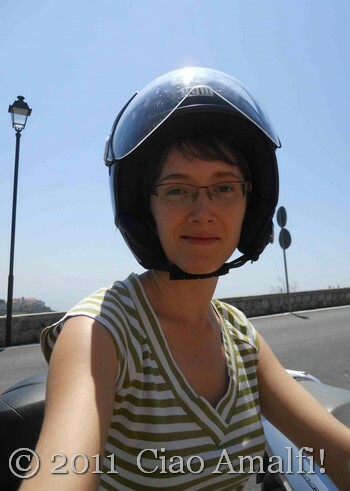 One of these days I’ll get a photo of me on the motorino without the helmet. But right now … I’m off for another ride! One of the things I love most about the religious festivals on the Amalfi Coast is that I feel like I see and experience something new every year. Not only are there different events planned, but there are also so many different spots to watch the processions and traditions to learn about. 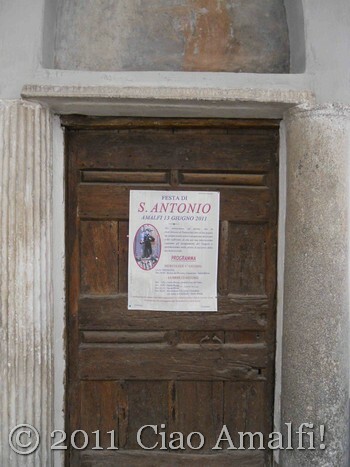 This year for the Festival of Sant’ Antonio that took place in Amalfi on June 13th, I had the chance to visit the Church of Sant’ Antonio in depth as well as watching the boat procession from Atrani and Amalfi. The festival began for me when I came across the marching band from Minori in Amalfi’s Piazza Duomo getting things started with a festive song. This is one of my favorite bands on the Amalfi Coast, and I was happy they were playing for this festival. Let’s get things started! There was something Felliniesque about the music and the setting, especially with the Japanese couple having their wedding photographs taken on the steps of the Duomo at the same time. Love moments like these! We following the band toward the church of Sant’ Antonio in Amalfi, which is located next to the Hotel Luna Convento, one of Amalfi’s great hotels that has been family owned for generations. 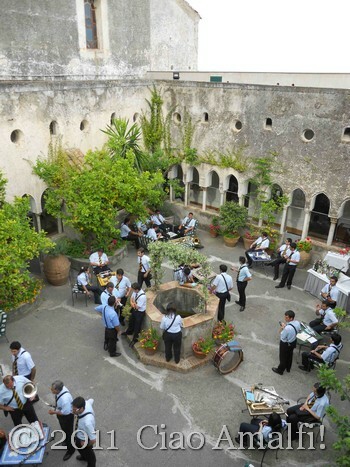 The hotel is connected to the church by a 13th-century cloister, which dates from when the church was founded as a monastery dedicated in San Francesco in 1220. 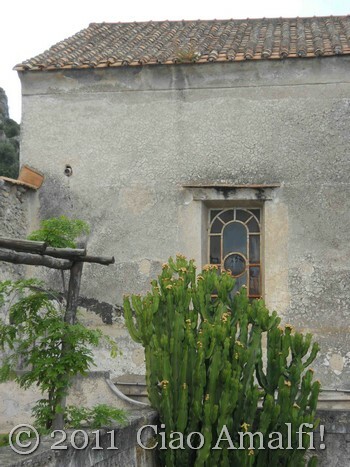 Instead of climbing the steep staircase up to the church of Sant’ Antonio, we stopped by the Hotel Luna Convento to say hello to the owner, Andrea, who is a childhood friend of the Tour Guide. I was admiring the cloister and Andrea suggested we go up above to take a look around, which was an opportunity we gladly took him up on! From above the cloister there was a great view of the bell tower for the church of Sant’ Antonio. And an even better view down into the 13th-century cloister. Across the cloister in the photo below you can see some of the simple stained glass along the nave of the church of Sant’ Antonio. 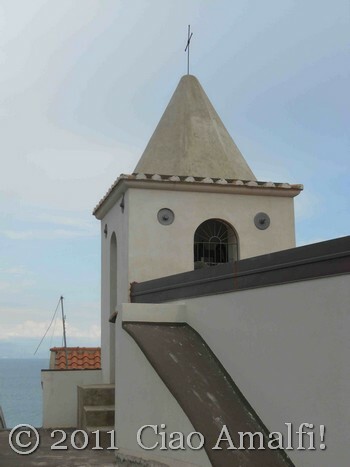 This church is so tucked into the buildings of Amalfi that have been built up all around it that it can be hard to spot! 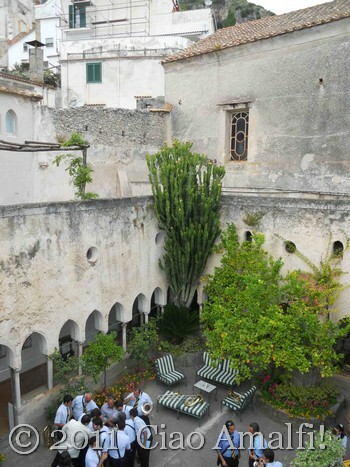 This cloister is described often as one of the most peaceful spots in Amalfi, and most days it probably is. But not with a marching band in it! The portico area in front of the church of Sant’ Antonio is so small that there isn’t a lot room for the procession to get started and have the band out there at the same time. So they wait in the cloister until the procession is ready to begin. This year I was so captivated by the architecture of the Hotel Luna Convento and the church of Sant’ Antonio that I just barely caught the procession as it was leaving the church. This is the original entrance to the cloister of San Francesco, which is flanked by two ancient granite columns. 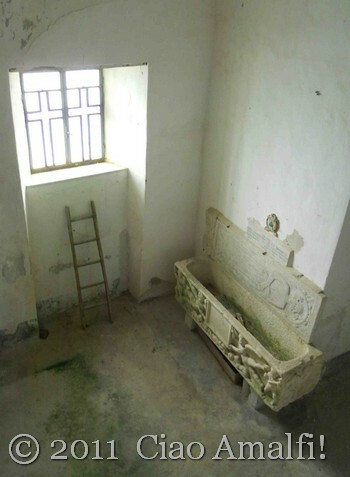 Although I cut it off in the photo below, above the door is a lunette with traces of a fresco depicting Joseph and the baby Jesus. I resisted the temptation to go running after the procession and instead stepped into the church of Sant’ Antonio. It was peaceful and empty after the procession had left, and the Tour Guide and I had a special visit of the church by Andrea from the Hotel Luna Convento. 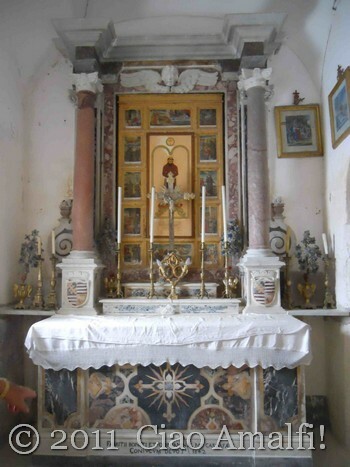 The original Gothic design of the church has been covered by Baroque decorations, which is very common in churches in Italy. Behind the altar are beautiful wooden chorus stalls dating from 1593. While I had been inside the church of Sant’ Antonio before, I had never been below to see the crypt of the church, which dates back to when the church was dedicated to San Francesco. Down in the crypt there is a Roman sarcophagus dating from the 3rd century with a tombstone mounted on the wall above it from the 14th century. On the other side of the crypt is a beautiful altar decorated in polychrome marble with paintings depicting scenes from the life of San Francisco. After another tour through part of the Hotel Luna Convento, we said goodbye to Andrea and headed over to Atrani to watch the procession. 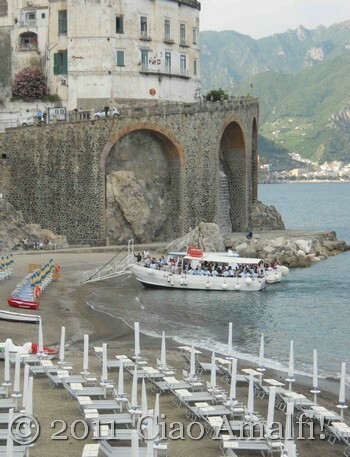 This is the only festival that is shared between Amalfi and Atrani, because the church of Sant’ Antonio is located between the two towns. 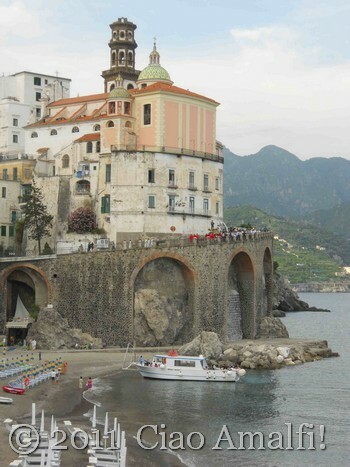 The procession follows the road from Amalfi to Atrani around the Collegiata di Santa Maria Meddalena. Here you can see the procession with the men in the red jackets carrying the statue of Sant’ Antonio as the procession returns to the center of Atrani. 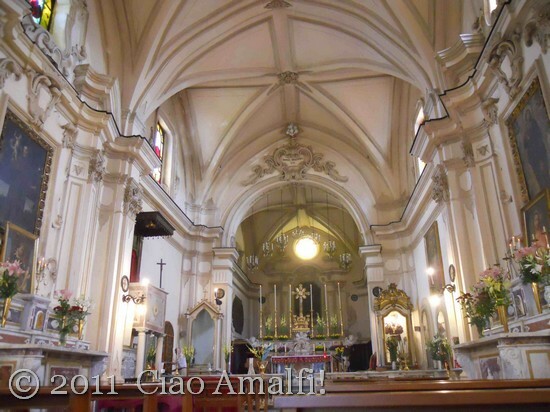 I love the sound of bells of Santa Maria Maddalena when they ring for religious festivals. I thought you might like to hear, too! 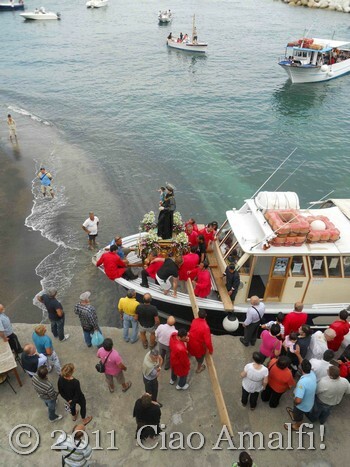 The procession continues through Atrani and eventually makes its way down to the beach, where the statue of Sant’ Antonio is carefully loaded onto a boat. They did this it in a different spot this year, just near the Le Arcate restaurant. The location seemed to make it more challenging to transfer the statue onto the boat. If you listen, just about everyone had an opinion about how it should be done! But the important thing is that the statue made it onto the boat safely, and after some work it was stabilized and ready for the boat procession to start. Here’s a closer look at the statue of Sant’ Antonio on the boat. The priest and the religious procession then gets on this boat. 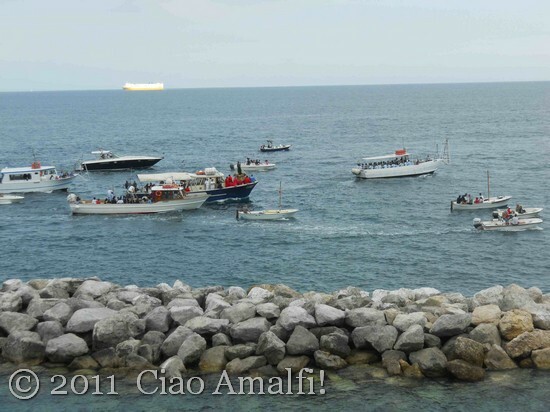 Two years ago, I had the chance to ride on this boat during the boat procession of Sant’ Antonio, which was quite the experience! I was so distracted watching the statue that I missed my favorite part … watching the marching band get on their boat! Here they are all loaded up and ready for the procession. There’s just something about a marching band playing on a boat that makes me so happy! Slowly the procession started to leave the small harbor of Atrani. You can hear the priest speaking, the marching band playing on their boat and all the boats blowing their horns. Here you can spot the statue of Sant’ Antonio (again, look for the guys in the red jackets) and the marching band boat to the right. This is truly a unique procession, and one of my favorites of the year on the Amalfi Coast! 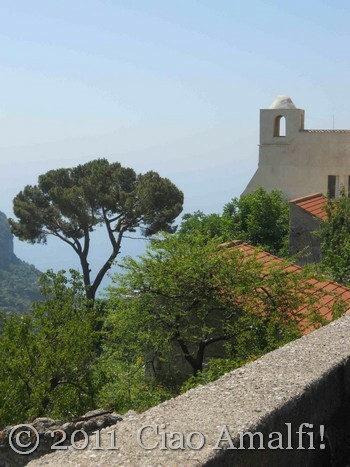 The procession heads toward Amalfi and continues down the coast to Conca dei Marini to salute the church of Sant’ Antonio located there before returning to Amalfi. 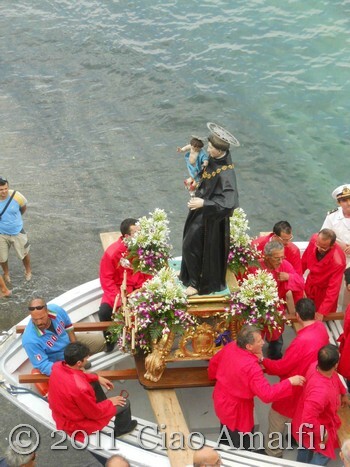 Once in Amalfi, the statue is unloaded and the procession continues through the town to the Duomo of Amalfi. I didn’t catch the procession as it arrived in Amalfi … but it’s nice to know I have that experience waiting for me next year! Yesterday was a whirlwind of a day … and will be a birthday I’ll never forget! The amazing day came to a close in Atrani, where the Tour Guide and I enjoyed an excellent meal at the Ristorante Da Zaccaria overlooking the sea. You can just spot the lights of the restaurant behind the trees on the left side of this photo. The weather was perfect and warm, the fish was very good and the setting … magical! 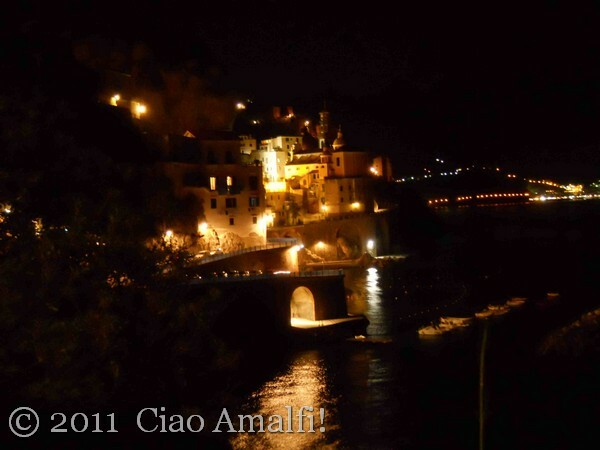 Atrani is so beautiful at night, and I stopped to take this photo on the way to Amalfi for an evening stroll. Thank you to everyone for the sweet birthday wishes and to my family and friends for making it such an incredible day! I love it when the bougainvillea blooms on the Amalfi Coast each summer, and I know I’m not alone in this passion. Photo Friday this week is dedicated to Saretta from Amid the Olive Trees, who stopped by last week’s Positano Bougainvillea post and left a sweet comment asking for more bougainvillea photos. That’s an easy wish to fulfill! 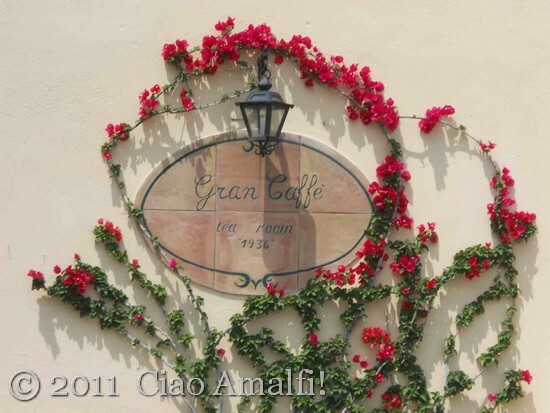 I wait each spring for the bougainvillea surrounding the ceramic sign of the Gran Caffè in Amalfi to bloom with its bright pink flowers. Such a delight! 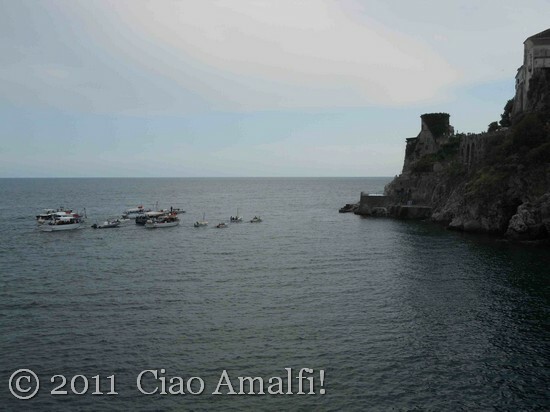 Wishing you all a delightful weekend from the Amalfi Coast! The Amalfi Coast is famous for its wonderful lemons, and there are so many ways to enjoy them during the summer. 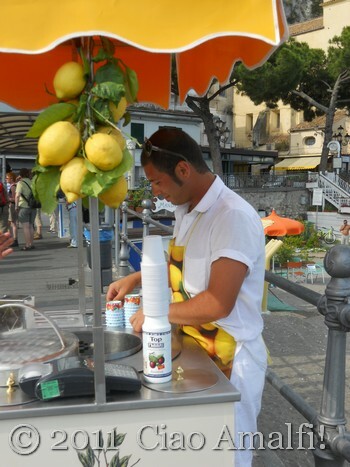 Now in Amalfi there is a new way – a Granita di Limone – served up with a friendly smile by Andrea. 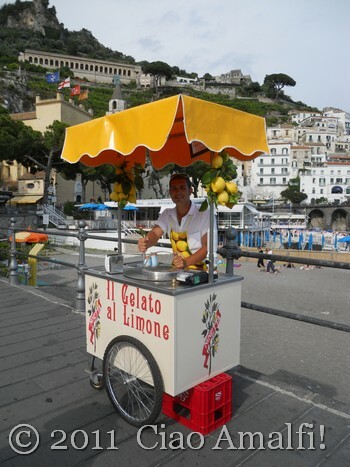 While his cart says “Gelato al Limone,” what Andrea has whipped up is a very refreshing Granita di Limone, or a Lemon Ice. A granita is more the consistency of a blended ice drink, but it is served in a cup with a little spoon. Andrea’s Granita di Limone is light and not too sweet, and its intense lemon flavor is enhanced by little pieces of lemon rind. Delicious! 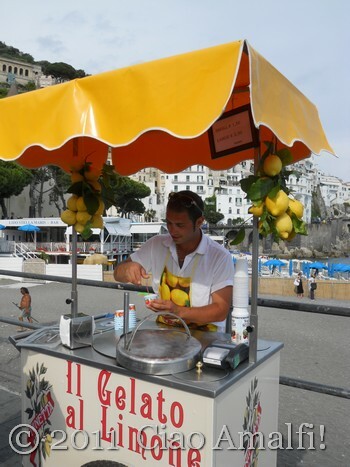 Andrea is from Amalfi and has just started this summer to sell his Granita di Limone overlooking the beach in Amalfi. He was already attracting a lot of customers Monday evening from the tourists walking by and the locals stopping to greet him and try out his granita. I often find Granita di Limone too sweet, with too much sugar masking the tartness of the lemons. But Andrea’s was excellent, not overly sweet and lots of lemon flavor! I know I’ll be stopping by here frequently this summer for something refreshing and cool on a hot afternoon. I wish Andrea a successful summer … and by the taste of his Granita di Limone … it’s going to be a busy one for him in Amalfi!